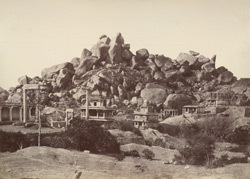 Photograph of the Chamundi Temple at Chitradurga in Karnataka, taken by William Henry Pigou, c. 1857. Chitradurga, a town and district of Karnataka, takes its name from the rock-strewn hill of Chitrakaldurg in the Vedavati river valley. It came to prominence under the Nayakas (governors) of the Vijayanagara empire. After the fall of Vijayanagara, the prominent Nayakas of Ikkeri, Keladi, Madhugiri and Chitradurga and the Wodeyars of Mysore ruled their principalities independently. It is known locally as Kallina Kote or Palace of Stones, after its rocky terrain and a massive fort built by the Nayakas (Nayaka Paleyegars). The powerful goddess Chamundi, the slayer of the demon Mahishasura, is a form of Devi or the mother goddess. Her temple, where as Ucchangiamma she was the patron deity of the Paleyagars, is sited amidst the rocks of the fort complex on the hill.